Nano Nation: You are all WINNERS! We had such a blast with this year’s National Novel Writing Month Pitchapalooza. So many pitches with AWESOME imagination and an ASTOUNDING display of talent. Thank you so much to all the writers who participated in this year’s NaNoWriMo Pitchapalooza! This year’s Fan Favorite is CLARE VATERLAUS BIRD for her book The Cost of Silence! Her pitch is timely, full of stakes, and has a terrific title. She gets a free one-hour consultation with us (worth $250). Congratulations, Clare! 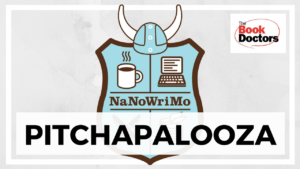 Kudos again to MARY JO TALBOT, NaNoWriMo Pitchapalooza winner for Watching Wilhemina, a middle grade novel about a rock-guitar loving girl, her diagnosis with type 1 diabetes, and her discipline-challenged service dog. Mary Jo will receive an introduction to an agent or publisher appropriate for her manuscript. We hope you’ll keep in touch. If you’d like to receive monthly publishing tips delivered to your inbox, click here to let us know. We’ll also share info about our live Pitchapaloozas and workshops around the country. Get publishing tips on our YouTube channel, and chat with us on Facebook and Twitter. We’re hosting a live Pitchapalooza in Brielle, New Jersey on May 1. We’ll announce our special guest judges soon. Come pitch us at the Brielle Public Library. Starting April 18, we’re leading an eight-week master class that’ll teach you how to get your book successfully published in today’s ridiculously competitive marketplace. We hope you can join us. Learn more here. Congratulations again to Clare, Mary Jo, and all the Wrimos who bravely shared their awesome pitches.